← Are You Feeling Stuck on a Project? Given the auspiciousness of today, I thought it would be a good time to do a post on the silliness of Friday the 13th. The absurdity of Friday the 13th has always puzzled me. It really is just a day and the only reason that it garners power over anything is because we give energy to the idea of Friday the 13th by perpetuating the myth. The title of this post includes the phobia: friggatriskaidekaphobia. One can learn from Wikipedia that this is a compound of Frigga, the name of the Norse goddess who gave us the name Friday, and triskaidekaphobia, fear of the number 13. I happen to like words, but a word like friggatriskaidekaphobia  when, outside of days like today, would you use that? Maybe more importantly, who would use that word? Maybe psychiatrists or psychologists? 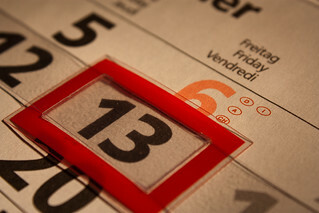 If you have 3 minutes and 3 seconds (estimated reading time), click-through and read the article: Friggatriskaidekaphobia and Other Quirky Calendar Events. This entry was posted in News and tagged Archives, Friday. Bookmark the permalink.